Traditionalist may use masa with fruit or chocolate to make a steamy blend of atole. Others use video game explosions, post-punk basslines, and dancey drums to brew up a sweaty pot of Atole. 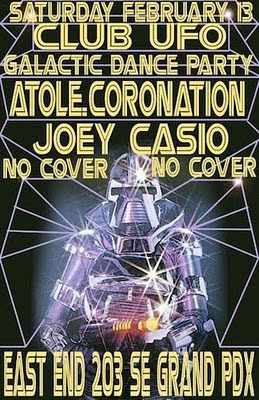 Others include PDX heretics Atole, a dance rock, disco mash-up of Italo electro beats and SFX wed to krautrock and decidedly punky exaltations. It’ll make you move. The boys of Atole have many faces around Portland and love to smother this town with their dance joy, whether it’s at house parties, spinning DJ sets, hosting webisodes, or booking gigs and playing with friends at Rotture. Read the rest and hear the noise on OMN.